The pleated filter is the backbone of most HVAC systems both new and old. Acting on its own or as a pre-filter in a multi-stage filtration system, the pleated filter is a versatile and important component for equipment protection, indoor air quality, and (if properly selected) for energy and cost savings. Commercial Filter Sales offers Filtration Group’s extensive line of pleated products as solutions to the various needs of our customers. Commercial Filter Sales can help you select which pleated filter best meets the level of filtration efficiency required while reducing restriction to airflow resulting in energy and cost savings. Filtration Group offers pleated air filters in various sizes and efficiencies. 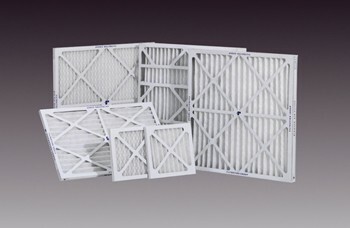 In addition to standard sizes, Commercial Filter Sales can make specials size pleats to fit any odd size filter rack. Series 400 Pleat (Standard and High Capacity) – This pleated filter is available as a standard capacity MERV 8 and a high capacity MERV 10 pleat. CFS offers the Series 400 for 1″ and 4″ Standard Capacity applications, and 1″, 2″, and 4″ High Capacity MERV 10 applications. NOVA Pleat (Standard Capacity) – CFS offers the NOVA for 2″ Standard Capacity MERV 8 applications. Series 1100 Pleat – A MERV 11 pleat available in 1″, 2″, and 4″ thicknesses. Green Pleat – A MERV 13 pleat meeting the requirement for LEED Buildings. Available in 1″, 2″, and 4″ thicknesses.